A group workspace has members who work with its documents. You can designate any PureCloud user and any official Directory group as a member of any workspace. Important: To manage access to sensitive files, we recommend adding individual users to workspaces instead of Directory groups. If the owner of the Directory group adds people to the group, then those same people receive access to the files in the workspace. If a rule determines the membership of a Directory group, and a new user meets that rule, then that user is automatically added to your workspace. Tip: To add lots of members to a workspace, use groups. A workspace can have a total of 200 users and groups combined. For example, you can either add 200 users or 200 groups, or 100 users and 100 groups. 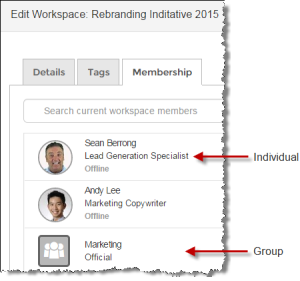 Notes: To view and manage content within a group workspace, you must add yourself as a member of that workspace. You cannot add social Directory groups as members of a workspace.